will differ from the averaged observed amt. particularly if it is windy ! 0 2230 hrs. T T 29.3 Snow just started and the dew point is 13.5°F. 1 2300 hrs. T T 26.7 Snow is very light and fine and the dew point has increased to 20.8°F. Currently the basic form is broken and irregular particles with moderate riming and rarely seen single crystals and very slow accumulation rate. 2 2400 hrs. 0.2 0.02 25.3 The dew point has increased to 22.5°F and a light snowfall rate. Jan 4 0100 hrs. 0.4 0.05 24.7 The high wind since midnight is 15 mph mainly from the north. The snowfall rate remains light. Will start observations early tomorrow as the snowfall rate remains light. 4 0700 hrs. 1.8 0.20 22.1 Wind to 27 mph overnight caused some drifting. 5 0800 hrs. 1.9 0.20 22.1 Not as much wind this past hour and looking at the radar the western Glen Allen area is near the back edge of the snowfall. It looks like the snow should end within the next hour. 6 0915 hrs. 1.9 0.24 24.5 The snow ended around 0810 to 0815 with no added accumulation. The liquid precipitation has been adjusted after melting the 8-inch gauge and taking a core sample. The 12-inch tripping bucket gave a total of 0.21 inches but the heater in the gauge evaporates some of the liquid. The eight-inch gauge gave 0.24 inches and the core sample gave 0.25 inches. 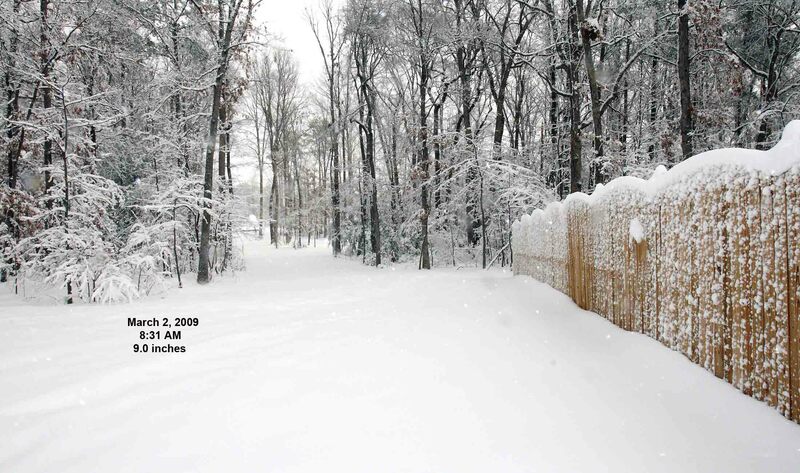 With the surface temperature as low as it was it was hard to rationalize a liquid to snow radio of less than 10 to 1. But after all the observations 0.03 inches will be added to the total. One other observation made last night at 2300 was the broken and irregular particles had moderate amount of riming. Thus the snow to liquid equivalent ratio was 8 to 1 !